The most high tech, versatile, reliable Photobooths anywhere. And the booth itself is huge. Can be adjusted in height and width but basicly is up to 8' high by 8' to 10' long with a width of between 6' and 8'! Photos are unlimited for the event plus they are either in black & white or color. You may sit on the included bench or stand to have photos taken...up to 12 to 15 people at a time! Included in the Wedding Package is a beautiful scrapbook with your copy of all pictures taken, a flashdrive with all images taken, and use of our extensive prop box! Our props are theatrical props from all over the Country...Disney, Vegas, Scottsdale New Orleans & Memphis with sports hats from their Team Shops. We don't shop at the Party Store. This is NOT the 2' by 4' attic crawlspace photobooth you have experienced at Cedar Point, the old Geauga Lake or even at other Weddings or events! AND...we bundle the Photobooth price when you order our award winning DJ service! 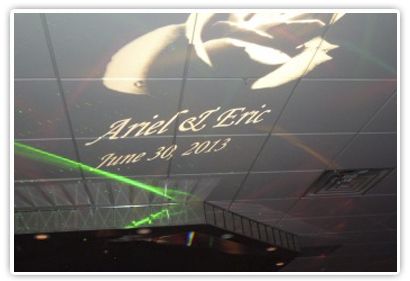 Picture your names (Bride & Groom) attractively projected on the wall or dance floor all night long. We have 3 styles...Monogram, Name/Date, & Rose/Name/Date to choose from. The quality glass gobo is yours to keep and display in your Wedding Album! We can also make up Gobos for any special event with your imagination being the only limit to creative possibilities! We can create your own professionally done "Reflection Video". Pictures of the Bride growing up, the Groom, then both of you together, maybe some friends and family, with a customized soundtrack of your choice, beautifully packaged with extra copies made for the Parents of the Bride & Groom comp! Picture each couple in the Bridal Party entering the Main Ballroom during the Grand Entrance, each step being highlighted by our powerful, theatical spotlight! Enter the Bride & Groom to a rousing welcome with each step traced by this truly glamorous spotlight! Then during all the formal dances (the First Dance, Bridal Dance, etc.) we use a different color of light to highlight each couples' introduction! Add this spectacular laser laden light tree complete with 4 totally different laser lights! Mounted high on the adjustable tree and pointed in different directons this special lighting add on is truly awesome! Imagine Elvis thrilling your guests, or how about Frank Sinatra crooning the old standards, or Michael Jackson singing AND dancing just for you! 20 to 30 minute performance time followed by a short meet and greet session! 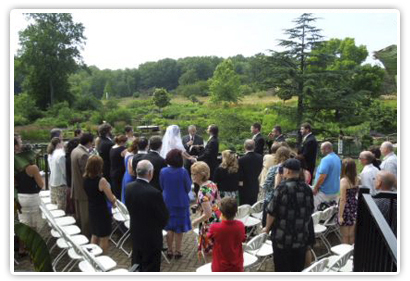 We can customize your Wedding Ceremony with beautiful music YOU can select performed on a small, portable sound system! A cordless mic is available for the Officiant. Karaoke is always a fun and entertaining Wedding Option! "Be the star that you are!" 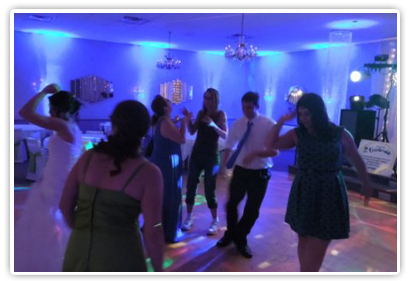 Experience the elegance & ambiance of our colorful Up-Lighting.Stand alone or DMX controlled. Call for more information on pricing. No two Wedding packages are the same! Staging is courtesy of La Vera Party Center in Willoughby Hills and the Wyndham Hotel in Downtown Cleveland. Folks we have the Wedding Packages and creative Options to make any reception or event unique, exciting, and glamorous! There is no other Company that can offer so much, so qualitively and bundle priced to boot! There is no such thing as a "cookie cutter" or "mediocre" event when you hire Absolutely Unbelievable Entertainment to MC and DJ! Call or click today! "We Deliver WOW...Guaranteed!"